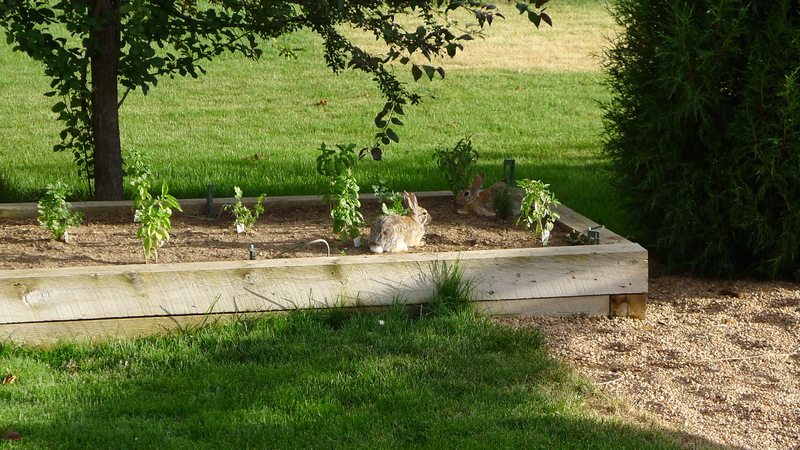 My herb garden is so bountiful this year that we’ve attracted four fluffy, big-eared, backyard residents! They deem my cilantro and parsley the most delicious of all things. I’m so honored. I’m not really sure, but I think it may have something to do with two brown-eyed girls who are so delighted to see them hopping and munching and doing bunny-cute things in the garden. Plus, (much to my dismay) the girls have named the smallest and cutest of the bunnies. Meet Peanut Butter, readers. Peanut Butter started the summer as a teeny little thing, but a few months of garden noshing have led to quite an impressive growth spurt. Peanut Butter and pals are thriving. My parsley and cilantro are not. Lucky for me, they don’t much care for basil, so I have a bumper crop this year. Pesto recipes are a-coming. Mucho pesto. The girls’ enthusiasm for our hoppity backyard visitors makes me think that it’s worth some sacrificial cilantro. It just is. I know, I’m getting soft. On another note, it’s still hot as balls here! Yesterday we broke a record for this time of year: 98 degrees. Our air conditioning, bessedly, still works, but we try not to over-use it, so oftentimes it’s about 78-82 degrees in this house, and that’s enough to make me wave the white flag where cooking is concerned. My latest obsession? Bruschetta. And breakfast salads (so weird and I’ll post on that later, I promise). Bruschetta is the best when it’s blazing saddles outside. All you need to do is grill some good bread, stick on some quality toppings and viola! Good to go. We’ve been having lots of bruschetta lunches and dinners around here lately. I usually offer up two different kinds and call it good. This particular recipe features peaches, which are so good right now. Well, they’re good in most parts of the country. Here? Not so much. Usually we get Palisade peaches in August, and they’re divine, but I haven’t been impressed with the harvest this year. As a result, I opted to use nectarines, which are sweet and juicy and bursting with flavor at the moment. The original recipe calls for peaches and ricotta cheese, but I had just been to Whole Foods and–luck be a lady!–got my hands on a ball of fresh burrata cheese, so I substituted. Boy, I wasn’t sorry. 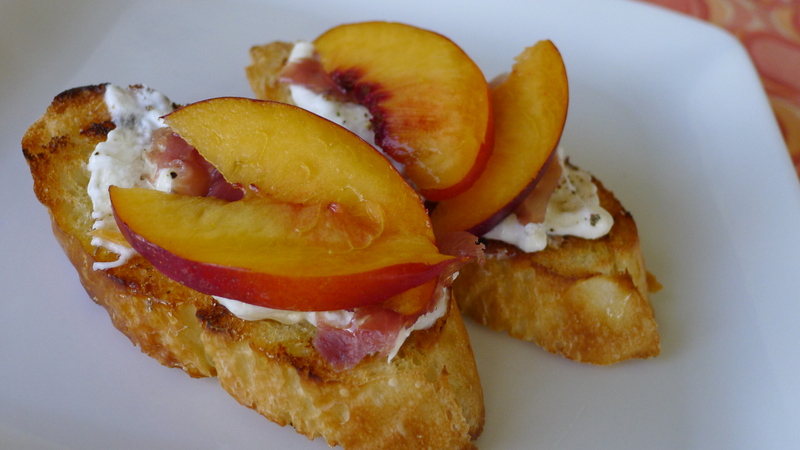 Rich cheese, crunchy bread, juicy nectarine…mmm. Honey, prosciutto and coarsely ground black pepper add a sweet-salty depth, which makes this a darn near perfect nosh. If you have the right ingredients, and they’re in season (which they are now, so hurry! ), I can’t think of anything nicer. Paired with an icy cold glass of pinot grigio or rose, you’ll decide that hot, steamy summer can linger just a bit longer. Drizzle slices of bread with olive oil and grill until char marks form. Let cool slightly. Spread bread with cheese; sprinkle pepper over. Top with prosciutto. Drizzle with honey, top with a few slices of peach/nectarine and a few threads of chopped basil, if desired. *the first few times I made this, I didn’t add any herbage. Then I decided to add basil, and I really liked the result. Mint would be brilliant, too. I’ll be off the grid for a few days; a cherished friend is coming for a visit (barring hurricane assholery), and I’m looking forward to showing her all the delights that Boulder has to offer. Best wishes for a lovely weekend. Looks wonderful my friend! 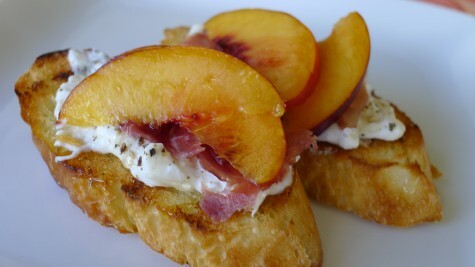 I love the sweet/savory mix you get with prosciutto and fresh fruit. The bunnies are cute! Oh gosh, I want to eat that RIGHT NOW! We had burrata at a restaurant last week, simply served with olive oil and sea salt, to be spread on grilled ciabatta. It was lovely. I love a good bruschetta myself, except I’ve not had the chance to hit the farmer’s market much this year so I’ve not been able to take advantage of the summer’s bounty. I’m not sure what it is about this summer – maybe it’s the crappy cool and thunderstormy weather, and I spent much of it cuddling with a newborn (a.k.a. being lazy) – but I’m so not with it on so many things. It’s already the end of August, perhaps there’s still time for some bruschetta. It sure does look divine. We had bunnies in the garden this year too but they met with an unfortunate when Mr. B got a new pellet gun. This recipe looks gorgeous! I’m so jealous of your burrata! Love bunnies! Peanut Butter is adorable. Best of all they are Mother Natures responsibility. Perfect pet. They eat cilantro, too???? NO WONDER I can’t find mine! It’s Bunnysboro around here. Like yours, my basil really flourished. The rabbits don’t seem to be big on oregano and thyme either, but they do have a taste for chives and yes, my parsley is history. Since I have a bunny bumper crop and your girls love them, which would you prefer–my front yard bunnies or the back yard bunch? I’m giving you first choice and sending the rest to Katybeth. Back yard, of course! There’s already a party going on out there! Oh this sounds divine! Yes on the Pinot grigio and bruschetta for us. Don’t tell your girls that we’re thinking of raising meat rabbits next year. Or, um, don’t tell yourself, either, if that kind of thing upsets you. Bunnies are cute but they are heck on the garden! Hope the hurricane doesn’t mess up your weekend plans with your friend. Eww, locusts! I’m really glad we only get crickets and grasshoppers here. The bunnies and dear ate all our bounty before we did – after three years of trying, I just gave up! Love that they named him peanut butter though! Here’s hoping the weather won’t get in the way of your get together – hugs! You call one of the bunnies “Peanut Butter?” My heart just melted. Anything that cute, furry and named Peanut Butter should be allowed to nosh on your herbs. The bruschetta looks divine…(sigh)…why don’t you live closer?? I love you to death. I’ve been wanting to say this for awhile. Do you think it is possible to have one pain-free post? This one came close, very close, to the TKW I fell in love with. Applause. Thanks for weighing in! It’s true, there’s been more pain than usual this summer, and I apologize if it makes you uncomfortable. Maybe I should warn readers by putting “pain” in the tags? I think I just might do that; that way, if it’s not something they want to read, people can bypass it. Genius. See what good feedback does? For more pain-free, I suggest you check out the post titled Lessons. No pain there, I promise. And, if someone would get up early and grill the bread FOR me I would SOOOOO eat this for breakfast!!! That sounds amazing. 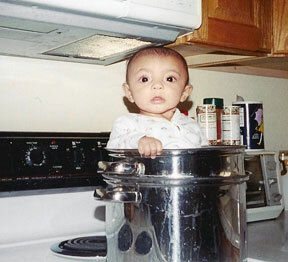 Which reminds me: Why have I been cooking when it’s 108 out? Bruschetta and sandwiches for the rest of the summer! 108? Holy Bejeezus. Run to the bread aisle–now! Hey there girl…finally starting to catch up on my readin’ and much to my delight…this one only requires grilling bread. I can do that. And I love me some bruschetta. Had to laugh at the “hot as balls” reference (which I see will also be in a post as I work my way backwards little by little)…that’s one of Hubby’s favorite sayings and every once in a while, I say it…aloud…in public…at work…with girls…you name it…and I get these WEIRD looks. Ahh, you’re such a good momma keeping Peanut Butter and pals well fed. What a beautiful heart you have. Son and I have been reading The Velveteen Rabbit so I couldn’t help but love this post. And this recipe sounds a helluva lot better than my son’s watermelon sandwich on baguette for breakfast. I’m positively swimming in mint and basil — I may have to add them both. Sounds delish! “herbage”???? Great word. Will try to use everyday for the rest of the week. My herbage is needing a good trim before all the flowers turn to seeds because I want to try this. Bruschetta is my all-time fav. Anytime. Anyday. Hello my friend! I’ve missed you. Popping in for a quick visit while I have a moment to come up and breathe, and dreaming of those peaches (and also the pesto) that you speak of. Odd combo, but both so wonderful. I recently enjoyed the sweetest peach of my life whilst on a trip to Atlanta for work. Holy jumbo sweetness! Ovb2ci Appreciate you sharing, great post.Thanks Again. Cool.